We had another session at the Halswell Quarry on Friday morning. Only caught 5 birds but with all being different species at least we had variety. There was one each of Song Thrush, Blackbird, Greenfinch, Dunnock and Silvereye. Phil with the first bird of the day and his first Song Thrush. This morning, (Sunday) a few of us experimented with trying to catch some of the Welcome Swallows that are nesting in various buildings. Things started off very well with one caught within a few minutes but after that we didn't get it quite right so no further birds caught. We will try again, probably when they have large chicks. 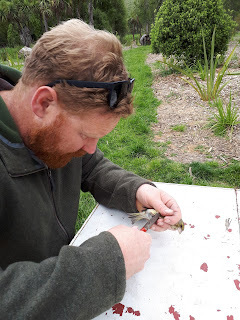 I have done a bit more bird banding/catching in the last couple of days, but I caught more than I banded. On Wednesday I had a round up in the neigbour's henhouse,and caught 15 individuals. 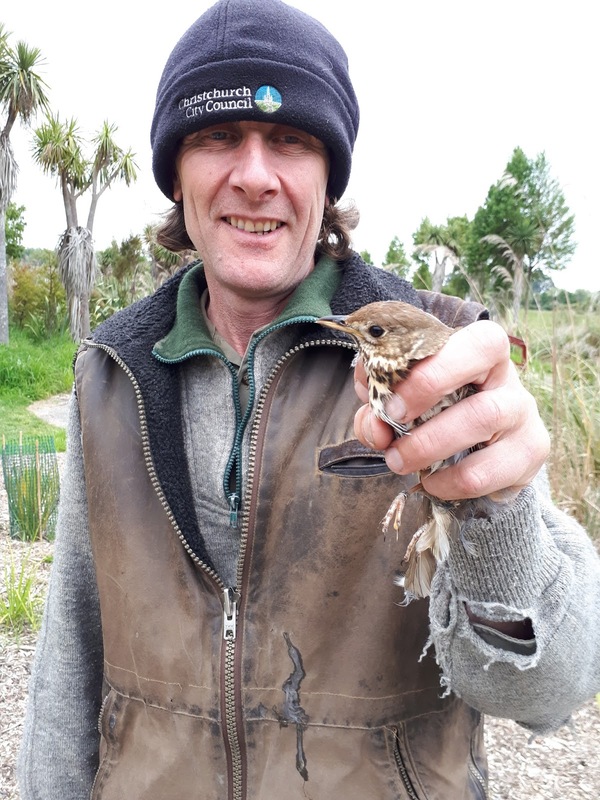 All were recaptures, and except for 2 Dunnocks, all were Chaffinch and all had been either banded or recaptured in the henhouse in the last week. Amongst the catch were 2 Chaffinch, 1 male, 1 female banded on the first day banding here so at the moment they are joint record holders. The old female giving me a farewell peck. As well, I checked a few bodies (birds) on the road and 1 was banded, a Blackbird banded as a juvenile last November, so it had a relatively short life. Fortunately, although the band was a bit munted, it was still readable. Blackbird - 6 (5) included was the first juvenile for the year. Chaffinch - 1 (1) the recap was banded on the first day of banding here and is now the oldest bird of any species recaptured. On the first day 8 Chaffinch were banded and 3 of these have been recaptured in the last few days, over 2 years later. What could be better than to spend a sunny Wellington morning banding behind the exhibits at the Zoo? Catching sufficient birds for everyone to play with of course. A total count of 48 meant that the 7 Level 1s had good session and even the 3 trainers could get hands on occasionally. For the first time in a while the fat we put out pre-feeding is being taken. We arrived back to Littles Road yesterday (Sat 14th) for a week or so. While checking the property I noticed a number of birds in the neighbours henhouse. So instead of doing chores I used a hand net to have a round up, almost all birds caught were Chaffinch. There were House Sparrows also but they all managed to make their escape. Twelve Chaffinch, 4 new and 8 recaps and a solitary recap Dunnock were caught. Most of the recaps had been banded recently with a number originaly caught in the henhouse, but one, a female Chaffinch was banded 12 Sept 2015 the first day banding here. It was at 763 days the oldest bird recaptured at this site. Today with very simular results I had 2 catching sessions. Today's total was 4 new and 11 recap Chaffinch and 2 recap Dunnock, 1 this morning and 1 this afternoon. Again most of the recaps were recently banded, including several from yesterday. However one male Chaffinch was banded on the first day banding here so at 764 days is now the oldest bird of any species recaptured here. This bird was the second Chaffinch banded here and this is its first recapture. By far the majority of thr Chaffinch were adult males. 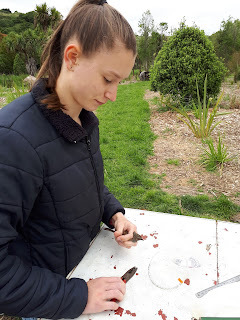 On Thursday morning a small group of banders gathered at The Halswell Quarry Reserve to start our Christchurch banding group. This is primarily to train people keen to improve their banding skills and get their Level 2 & hopefully Level 3 permits. It was a relatively quiet start with only 7 birds banded, this was partly due to a slow start with erecting the nets. Not only was the area unfamiliar but also the gear which had not been used for several years. 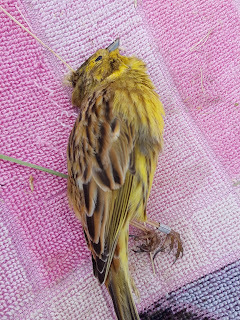 The catch included 3 Blackbird, 2 Silvereye and 1 each of Greenfinch and Grey Warbler. Our scribe enjoyed a considerable amount of quiet time. I have recently received notification of a couple of recoveries from the Banding Office. 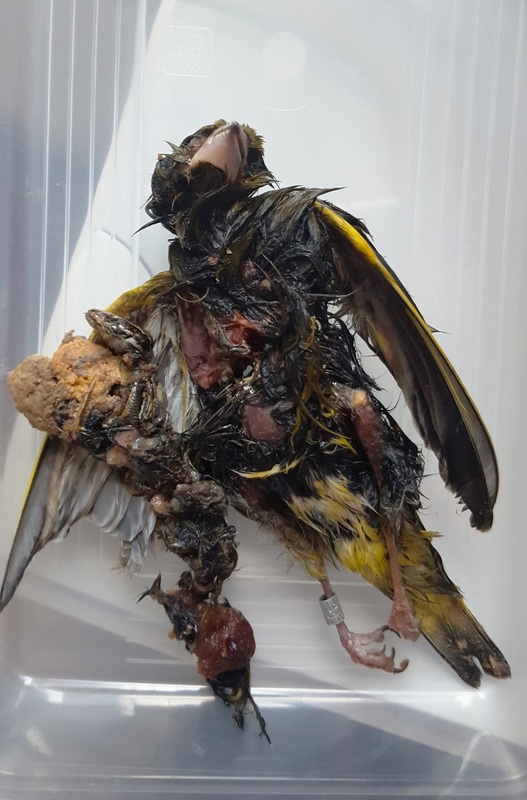 A greenfinch recovered when it was regurgitated by a cat along with other prey/food items in Island Bay. It was banded at the Wellington Zoo on 9 Jan 2015. It was recovered 985 days from banding at a distance of about 3k. A Yellowhammer recovered freshly dead on a hay bale at Littles Rd about 1.5k from where it was banded on 6 Jan 2017. It had a fresh wound on one side of its head and appeared to have been attacked, I suspect by a Magpie.